Researchers track air pollution and ozone using data from the Total Ozone Mapping Spectrometer Earth Probe (TOMS-EP). TOMS-Earth Probe was launched on 2nd July 1996 by the NASA. NASA space craft Aura carries the Ozone Monitoring Instrument (OMI). The OMI instrument can distinguish between aerosol types, such as smoke, dust, and sulfates, and measures cloud pressure and coverage, which provide data to derive tropospheric ozone. 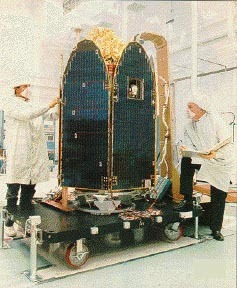 The Aura satellite was launched by NASA on July 15, 2004. It carries four instruments (HIRDLS, MLS, OMI, and TES). 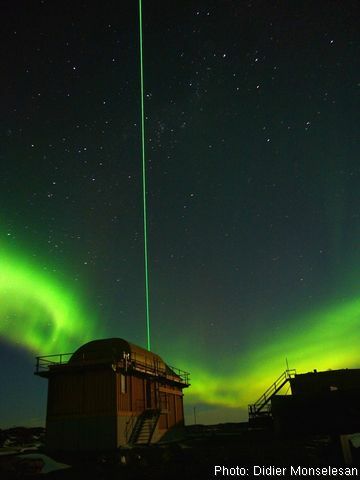 Each instrument provides unique and complementary capabilities that will enable daily global observations of Earth's atmospheric ozone layer, air quality, and key climate parameters. Aura is part of the group of satellites termed the Afternoon Constellation (or A-Train), it flies several minutes behind Aqua. More on this satellite on the Aura mission page. Ozone can also be measured by an optical remote sensing technology called atmospheric lidar (Light Detection and Ranging). Light pulses are emitted in the atmosphere, where they are attenuated and backscattered. As a function of time, hence of distance, the backscattered signal is collected on a telescope and permits to retrieve information about the components present in the atmosphere. For more informations about lidar, check out the tutorial Remote sensing using lasers. The Lidar at Davis station helps us to study ozone. Photo: © M.Lambert/Australia Antartic Division Australia Antartic Division.